A good temper can make or break a fine chocolate (and I’m not talking about disposition). 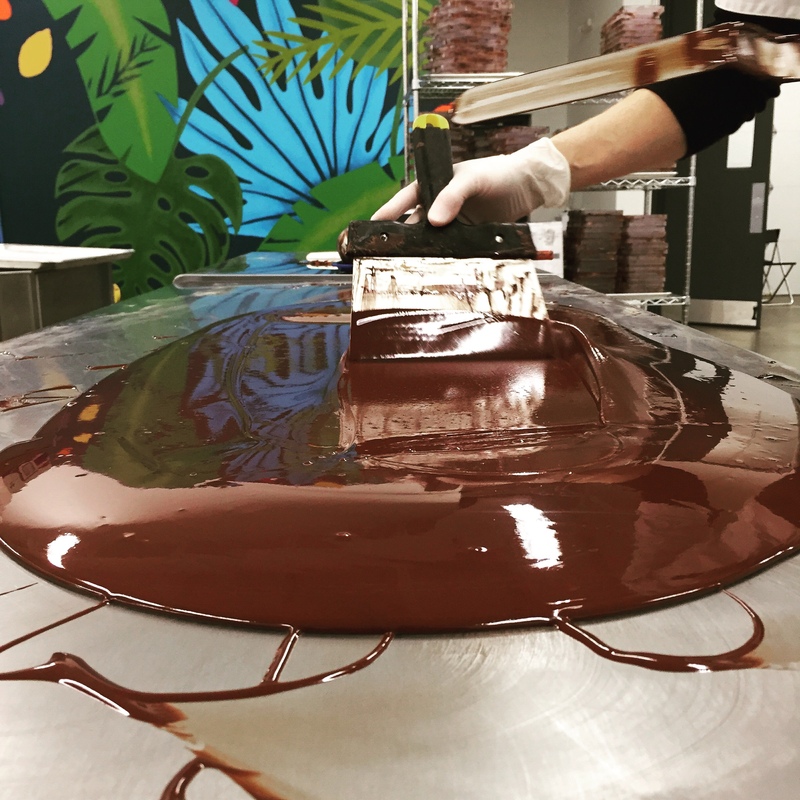 Tempering is the process of precisely controlling the temperature of chocolate as it cools and hardens to achieve the best shine, color, snap, and texture. Perfectly tempered chocolate has a uniform shine and color, a good firm snap, and melts smoothly in your mouth. Untempered chocolate has a gray, mottled appearance, is soft and crumbly, and melts too easily. No matter how good the flavor, crumbly gray chocolate won’t deliver the luxurious experience we all crave. Exact conditions for tempering vary slightly for each chocolate recipe, and small changes can have a big impact on the final product. For example, results can depend on the origin and percentage of the cocoa, the presence of non-cocoa ingredients like sugar and milk, the humidity and temperature of the room, the tempering technique, the cooling technique, and the temperature of the molds being used. In a nutshell, tempering is challenging, and it starts at the molecular level. Chocolate is made up of cocoa solids, cocoa butter, sugar, and sometimes milk. Every ingredient plays a role, but cocoa butter is the most crucial to tempering. Cocoa butter is like the house, and cocoa solids, sugar, and milk are like the furniture inside. If the house isn’t made out of nice, uniform building blocks, it won’t be stable, and eventually everything will collapse into a jumbled mess. When it comes to chocolate, the building blocks are small crystals that come from cocoa butter. There are actually six different types of crystals that can form when cocoa butter cools, but only one of them is considered ideal: the form V (aka beta prime) crystal. Its melting temperature is low enough to melt in your mouth, but high enough that it won’t melt in your hand (at least not immediately). It has a firm snap, uniform color, and pleasant sheen. It also contracts slightly as it cools, allowing hardened chocolate to easily release from a mold. Since a single crystal, called a seed crystal, can start a chain reaction that creates more crystals just like it (a process called propagation), a chocolate maker’s goal is to remove the five non-desirable crystals and allow only form V crystals to form and propagate. Because each crystal has a different melting point, the best way to do that is by manipulating the temperature. Form I has the lowest melting point, followed by form II, form III, form IV, form V and form VI. Form VI doesn’t begin to form until at least a few weeks in storage, so it’s not an immediate concern for the tempering process. However, all of the other crystals are present in untempered chocolate and need to be removed. To begin the tempering process, the chocolate is brought up to a temperature high enough to melt every crystal type and gives us a blank slate to introduce form V crystals into. To do that, the chocolate is gently cooled by agitation to a temperature that is cool enough for form V crystals to take shape, but too hot for forms I, II, III, and IV. The chocolate is held at this temperature for a short time to allow the form V crystals to propagate, and then the chocolate is warmed slightly. This makes the chocolate thinner and more workable without losing those form V crystals. It also melts any ambitious lower crystals that might have tried to form during the initial cooling phase. The tempered chocolate is then poured into molds and cooled gently to maintain that perfect crystal structure. If cooled too quickly, chocolate may crack, but if cooled too slowly, it may be overrun by undesirable crystals and lose its temper. Many different factors can impact the temper of chocolate, so it’s often regarded as the most finicky and unpredictable part of chocolate making. But with careful calculation, experience, and patience, the ideal tempering conditions can be found for each recipe, allowing the best shine, color, snap, and texture to shine through. So the next time you see a beautifully tempered piece of chocolate, you can tip your hat to the chocolate maker or chocolatier that carefully crafted it for your delight! Cheers! Before you begin, prepare all you’ll need. Choose 12 ounces or more of a chocolate with excellent flavor and smooth melting properties. Have the foods you’re dipping or molds ready nearby. If you’re starting with block or bar chocolate, chop it into small, uniform pieces. If the chocolate you’re starting with is tempered (all store-bought chocolate bars and chips will be), set aside about a quarter of it to aid in the cooling step (step 2). Warming: Warm the chocolate in the microwave in 30-second increments, stirring in between, until the chocolate is evenly melted and has reached 115-120F. Re-warming: Pop the chocolate back into the microwave for 10-second increments, stirring in between, until the temperature comes up to 85-90F. If all has gone well, you’re done! Test the temper by dipping a knife into the mixture. It should harden quickly (in less than 5 minutes) and have a uniform appearance without any streaks or spots. If it’s spotty, you’ll need to start the process over (you can use the same chocolate). Work quickly to dip your strawberries or fill your molds. As needed, you can pop the chocolate back into the microwave in 10-second bursts to keep the temperature in the 85-90F range as you continue to work. Exact temperatures may vary based on the brand and type of chocolate, and results are best if using 12 ounces or more at a time. Still curious? Read all about a variety of tested home-tempering techniques from Serious Eats’ The Food Lab. For questions and tips about using Harper Macaw chocolate, email hello@harpermacaw.com; we love to hear how you use our chocolate!